Just because you're not ready to write a down payment check for a house doesn't mean you can't get in on the tiny trend. Proof: Renters are squeezing into smaller apartments nationwide. The trend is expected to continue, especially if you live in a big city like New York, NY, or San Francisco, CA. But living in a smaller space can offer big benefits. You'll have less space to heat or cool (a bonus for you and the environment! ), there will be fewer square feet to vacuum or clean, and your stuff is always steps away. Ready to shed some square footage? Here are some of the smallest apartments for rent on Trulia (in order from tiniest to most spacious). Get ready to fall in love with less. These apartments are tiny but big on perks! Live in the heart of Old Ballard and learn just how charming life is on the Salmon Bay waterfront. The Ballard Avenue Historic District’s eateries are just four blocks north. Living in a tiny space has never been more comfortable. This apartment includes a kitchen with microwave and pantry, plus plenty of hidden storage all packed into 150 square feet. Amenities and internet are included, making it easy to get some work done if you can keep from being distracted by the view from the apartment’s floor-to-ceiling windows. When it’s time for a break, grab your bike from the secured bike storage and take the scenic Burke-Gilman Trail to Golden Gardens Park. There, you’ll find exceptional views of the Puget Sound and the Olympic Mountains. If you’re looking for a rental community that will help you fit right into Kirkland’s artsy, up-and-coming Eastside neighborhood, Areté is the place to be. With an emphasis on ecofriendly living and community, these apartments make it easy to settle in. The 170-square-foot flat is within walking distance of the weekly Kirkland farmers market, as well as local eateries like Flatstick Pub and the Lodge Sports Grille. How’s this for a bonus? The apartment community offers a weekly Sunday brunch. Live your own beachside fantasy at this 200-square-foot apartment, located in North Laguna (which puts you near the sandy shores of Main Beach and Shaw’s Cove). A spiral staircase from the main building descends to your studio enclave, tucked behind a private patio. And just beyond the furnished unit’s door, a stone path leads directly to the Pacific Ocean. After a day on the water, take Laguna Beach’s free trolley to grab a bite at 230 Forest Avenue. On the way back, make a pit stop at Heisler Park, where you’ll find inventive sculptures and creatively designed park benches. These petite apartments are expertly designed to serve as retreats from fast-paced city life. All units feature kitchenettes, private bathrooms, plenty of storage, and optional Murphy beds with tables. With this 233-square-foot option, you’ll enjoy a view of the neighborhood through the apartment’s expansive windows. Take in Mission Bay’s electic vibe with a bike ride down the San Francisco Bay Trail. You’ll pass AT&T Park, the Embarcadero Plaza, and Fisherman’s Wharf as you head toward the Golden Gate Bridge. Another advantage of living in this neighborhood? Transportation options! 77 Bluxome is close to the Caltrain station and major highways. These studio apartments in the Philadelphia, PA, suburb of Haverford pack lots of history into a 252-square-foot space. The studios are located within the historic Casa Del Sol house, on the former Main Line of the Pennsylvania Railroad. The Main Line connected downtown Philadelphia to its western suburbs. Its presence is still seen in the neighborhood today, and the area’s posh style influenced the design of these apartments. Far from cookie-cutter, the units feature hardwood floors, French doors, kitchenettes, and decorative fireplaces. Heat, hot water, and cooking gas are included in your monthly rent. Living on the Main Line means the opportunity to enjoy small-town life with big-city convenience. The units are adjacent to the Haverford College Nature Trail and local schools, shopping, and dining. But when the city calls, a direct rail takes you to the middle of Philly’s Center City. These new 300-square-foot apartments bring enviable amenities to Portland’s Alphabet District. Tucked among Old Portland–style houses and century-old buildings, the Tess O’Brien Apartments include full kitchens, luxury appliances, in-building washers and dryers, and crafty storage space. Enjoy views of Northwest Portland through your unit’s large windows or head down to the courtyard to cook up some barbecue by the fire pits. Plus, you just might have scored the best rental for you and your pooch in PDX. The units are pet-friendly and located two blocks from the pet-welcoming Lucky Labrador Beer Hall restaurant. The 405 is less than 1 mile away, for quick access to downtown and beyond. Enjoy all that Fort Lauderdale has to offer both downtown and by the sea in this recently remodeled, 300-square-foot studio. Hungry? Take your neighborhood’s quiet, canal-lined backstreets toward Las Olas Boulevard, which is filled with restaurants like the famous Rocco’s Tacos. Stay on Las Olas for just over a mile before crossing the sound for a view of the Atlantic stretching out along white sandy beaches. Back home, you’ll enjoy conveniences like a built-in cooktop, refrigerator, and microwave in the unit’s kitchen, a ceiling fan, Murphy bed, and easy-to-clean porcelain tile flooring (perfect for sandy feet!). If your bedroom shares the same space as your kitchen, laundry, and living room, then why not a great view of Boston’s Financial District too? At Watermark Seaport, 300-square-foot studio apartments feature floor-to-ceiling windows that span nearly an entire wall. Hardwood floors, granite countertops, stainless steel Energy Star appliances, Nest thermostats, and an in-unit washer and dryer will keep you comfortable in style. Building amenities include a state-of-the-art fitness center with group classes, an 18th-floor Sky Deck, and a second-floor terrace with grills. Hit the Boston Harborwalk for action-packed weekends at Faneuil Hall, the Freedom Trail, and the many restaurants, bars, and parks scattered around the harbor. When it’s time to get to work, you’ll appreciate the apartment’s electric-vehicle charging stations, bicycle storage room, and convenient access to the MBTA Silver Line and Amtrak. Can’t think of a better way to wake up than with warm ocean breezes wafting in from your private terrace? You’ll get that and more with this 300-square-foot furnished apartment. It raises the bar on small-space living, with access to Venice’s top VIP nightlife events and talks by up-and-coming entrepreneurs as a perk. Other benefits include free high-speed Wi-Fi, discounts with local stores and gyms, a surprise welcome gift, and one free item per month (Netflix, a book of the month, a printer rental). If that, combined with the walk-in closet, full kitchen in a separate room, and chic decor, hasn’t sold you yet, let’s talk about location. The apartment is just off Abbott Kinney in Venice Beach, where you’ll find everything from indie boutiques to hip restaurants. Venture beyond your block: You’ll find the Venice Beach Boardwalk and the ever-enchanting Venice Canals, both about a half-mile away. 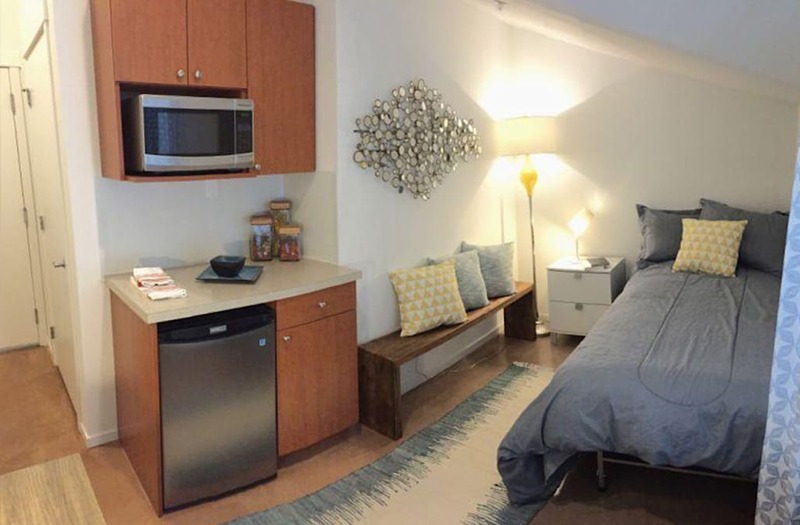 The post Are These The Tiniest Apartments For Rent In America? appeared first on Trulia's Blog.